The Hungarian Wirehaired Vizsla IS NOT the same breed as the smooth Hungarian Vizsla. The two breeds CANNOT be bred together. Despite appearances, the Hungarian Wirehaired Vizsla is an entirely different breed which originated in Hungary in the 1930’s, as a result of deliberate cross-breeding between Hungarian Vizslas and German Wirehaired Pointers. This came about from a desire amongst hunters to develop a dog with the excellent qualities of the shorthaired or smooth Vizsla, but that was more resistant to cold weather conditions. The breeding aim was that the Hungarian Wirehaired Vizsla should preserve all the inner and outer features of the shorthaired Vizsla, preserve the ancestral yellow or gold colour, and the hair should be rough and wiry. The Hungarian Wirehaired Vizsla was acknowledged by the FCI in 1966 as an independent Hungarian breed and was approved for exhibition in Australia from January 2007 at which time there was only one dog in the country. 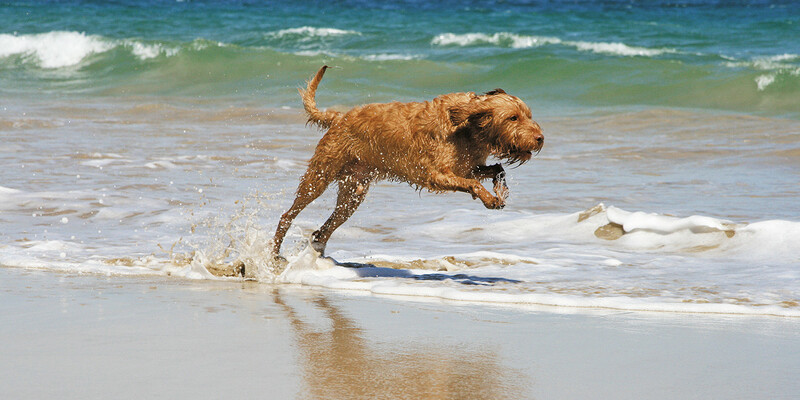 Since the breed’s recognition, more Hungarian Wirehaired Vizslas have been imported into Australia and New Zealand. The breed has now received full Kennel Club recognition in the United Kingdom and USA. Though the Hungarian Vizsla Club of NSW does not represent this new and relatively rare breed, we are happy to pass on any information we have. Please contact Ros Leighton on 02 4841 0282.